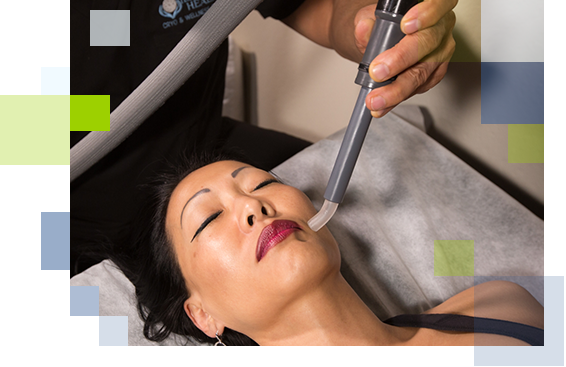 This form of cryotherapy is confined to the face. The Cryo Facial treatment is non-invasive and pain free and works through means of Cryotherapy or “freeze therapy”.The skin is rapidly cooled, using a beam of vaporized liquid nitrogen, to well below freezing in a matter of minutes using a revolutionary ‘cryo-probe’. This leads to a tightening of the microcirculation blood stream, known as vasoconstriction, and then dilation of blood vessels and capillaries which helps to flush toxins and impurities away from the skin.The process works to contract the skin and accelerate microcirculation which supports better oxygenation of dermal cells, encourages collagen production and helps to detox and rejuvenate the skin. The treatment only takes 10 minutes and the results are immediate and there is generally no post treatment downtime or after effects. The Cryo Facial can be conducted as a one off treatment but the best results will come with repeat applications. What’s more it can be taken as a stand alone or with other treatments, such as Mesotherapy.